After Chris and I got engaged my first thoughts turned not to the arranging the wedding, or buying my dress, but to the wedding cake. I got my priorities right. My theory is sort out the cake first and everything else will fall in to place. I actually bought the first wedding dress I tried on and my nephew who wasn’t quite 1 years old helped me choose it but that’s a completely different story. Let’s concentrate on the cake. We knew we wanted to get married as soon as possible, so the vast majority of the 6 months of our planning and preparation time I spent creating our wedding cake. Fruit cake is very popular in my family as you can tell by my previous Caribbean Christmas Cakes and Jamaican Black Cake so I knew I needed to make something extra special, something a bit more challenging and flavour packed to feed about 120 of our family and friends. A few sleepless nights later of conjuring up flavour combinations in my head I had it planned. 5 tiers of fruit cake, each with it’s own booze and fruit combination. 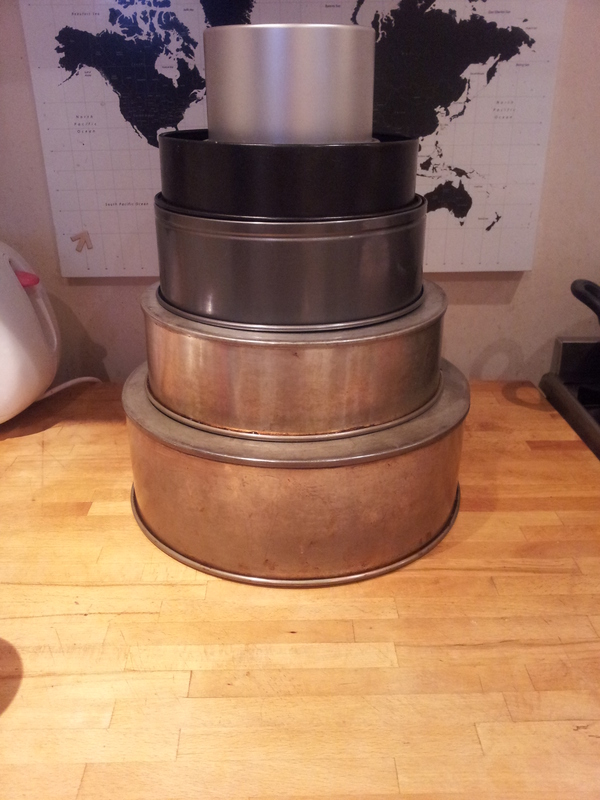 I quickly realised that I needed much BIGGER kitchen equipment than I owned to create the largest 12″ tier. 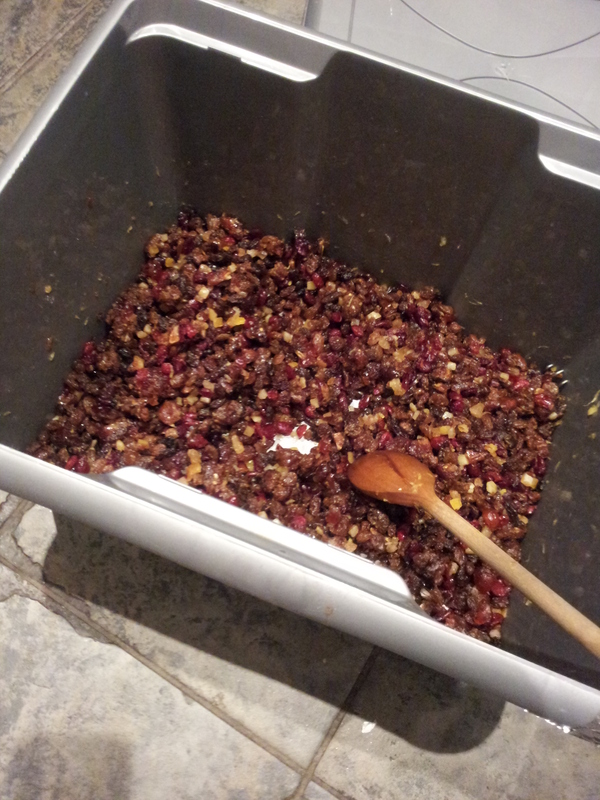 No bowl was big enough to house the enormous quantity of dried fruit to soak it in the flavoursome booze. A quick hunt round the house and I discovered a hard plastic storage box which I disinfected and decanted all the ingredients into. I like to soak my fruit for as long as possible, in a bit more booze than is recommended so then I don’t really need to feed the cooked cake on a regular basis. It matures nicely wrapped up in greaseproof paper and stays moist. I pour enough booze onto the fruit to give it a pungent glistening alcoholic coat, but not so much that it’s swimming in a pool of booze. If you stir it regularly you can make sure the fruit is absorbing the booze. There should be no liquid left after 2 weeks. For my 5 tier wedding cake I ended up baking 8 actual cakes! Mainly due to my own stupidity and also because the oven broke. The 2 cakes which required an extra 3 hours of baking (when added onto their original 4 hours of baking is a lot of time in an oven!) made me realise that the oven wasn’t playing nicely. I invested in an oven thermometer to check the temperature throughout the wedding cake baking process and followed this precisely. Only to then incinerate one cake completely. It was a charcoal cake. 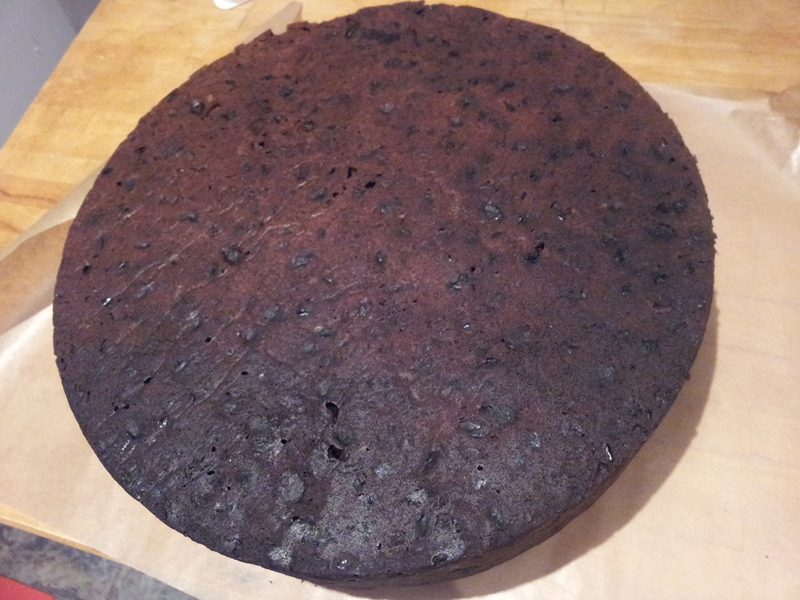 Although once I chipped away the outer charcoal casing the centre of the cake was really rather nice. I was determined not to let the amaretto soaked cherries to go to waste. So I chopped up the inside of the cake and served it with ice cream. It was delicious! The other ‘ruined’ cakes did not go to waste either. I decided to donate one of my reject cakes to the church bake sale and quickly iced it. 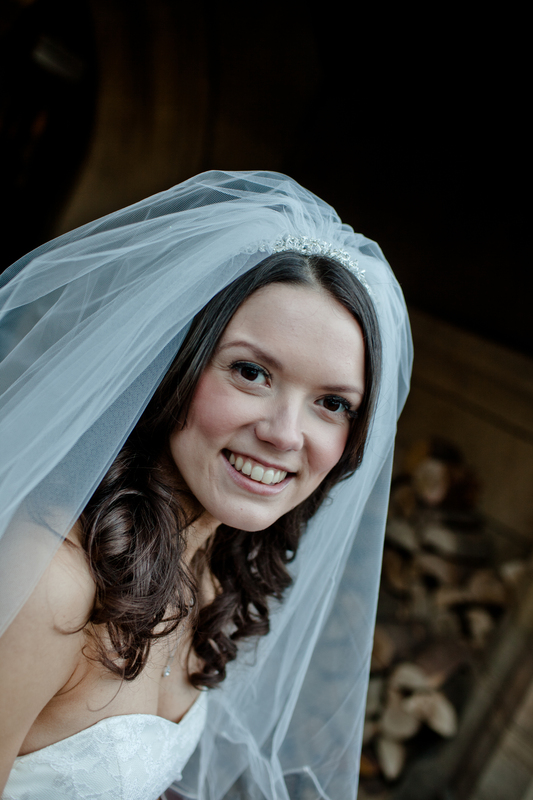 However upon arrival we discovered we were a day late for the bake sale… Ah the brain fog of wedding preparations! So I shared it with friends instead when they came round for festive drinks. I must admit the extra booze and fruit in the cake made it tricky to cut but it was so tasty!! The final uniced extra boozy tier is still maturing nicely in the cupboard. I’m going to save that one for a special occasion. I’m sure it’s good to keep for at least a year or two. I despaired slightly as I still had 3 cakes left to bake with a broken oven. Then I did a bit of googling and decided instead to dismantle the oven, clean it and put it back together. Thankfully this seemed to do the trick! I also watched the other cakes like a hawk and turned them every hour to avoid any charring from the hot spots in the oven. The result? The final 3 tiers were the best cakes I’ve ever baked in my life. I’m sure that extra care and attention was the secret to their success. They were so level they didn’t need to be propped up when icing them to get an even top. The method for each sized cake is exactly the same and after baking 8 of them I was starting to know it off by heart. I think this Christmas I may make chocolate cakes! After soaking the fruit in booze for at least 24 hours (if not 2 weeks) you cream the butter, sugar and fruit zests together until light and fluffy. Then to add the eggs, whisking them into the butter and sugar mix one at a time. I had to use the biggest bowl I own for this job as the eggs inflate like mad when whisked. The mixture can start to curdle or separate at this point, but it’s not the end of the world. You can whisk in a little flour to stop it separating but it’s still going to taste pretty amazing. Then to prepare the dry ingredients. 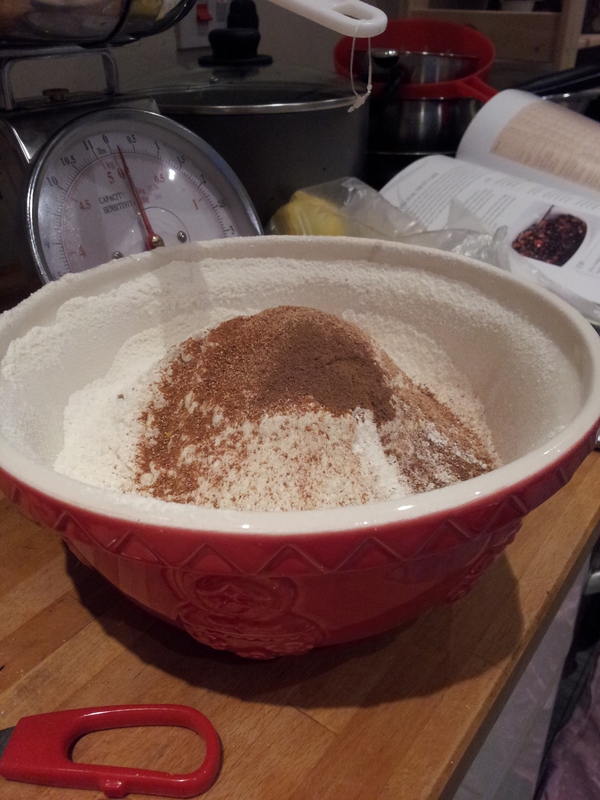 A separate bowl was definitely required to sift the mountain of flour and spices together. I love a spicy cake, so I’m always quite liberal with the cinnamon and nutmeg. For the 12″ cake I didn’t have a bowl big enough to fit everything in so had to resort to stirring it all together in the plastic storage box! Who knew it was so difficult to stir things in a square box… I ended up with cake mix right up to my elbows and consequently my face and hair. But I did it! You have to fold the wet and dry ingredients in a third at a time until it’s all incorporated. Then finally fold in the ground almonds, chopped nuts and treacle. 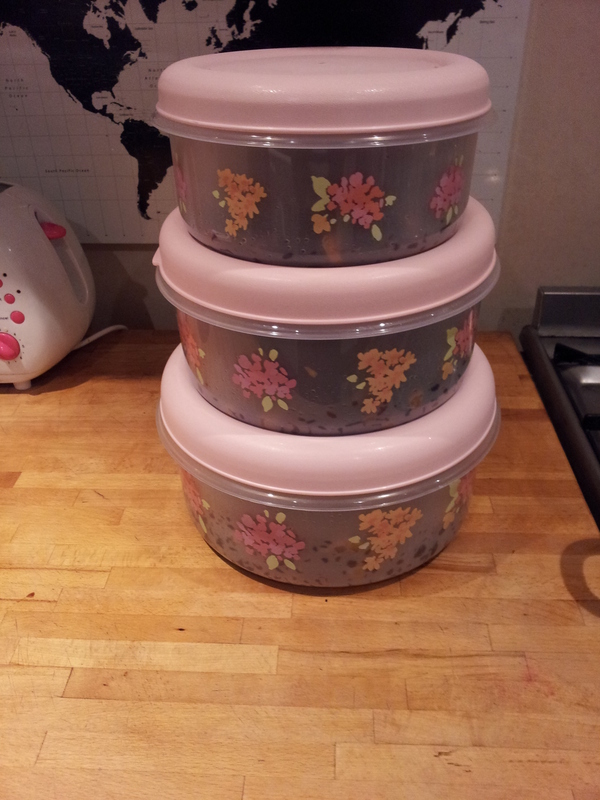 I hired the largest cake tins from my local cake shop. At 50p a day it was much cheaper than buying massive cake tins and I don’t have to worry about storing them in our already full to capacity flat. It’s really important to double line and grease the cake tins to help prevent the cake from burning as it needs to bake for a really long time at a low (ish) temperature (150 degrees Celsius). I always tie an extra collar of greaseproof paper around the outside of the tin and use that to prop up a greaseproof paper lid to protect the top of the cake from burning too. 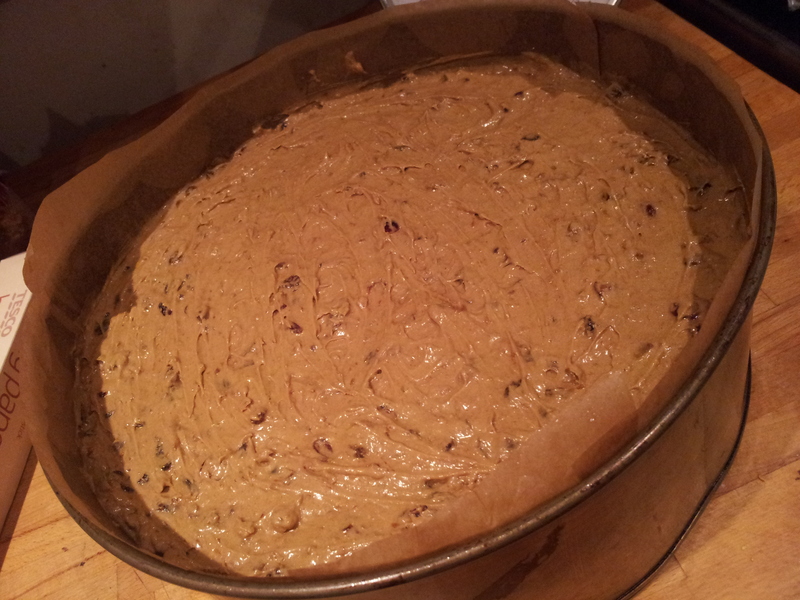 As it doesn’t have any raising agent in it the fruit cake won’t really rise any higher than it sits in the tin uncooked. I wanted to try to get the most even finish that I could so I carefully layered the mixture into the tin, spreading and flattening it down with a spatula. No air pockets for me thanks and the smoothest top I’ve ever achieved. The largest cake obviously takes the longest time to bake. 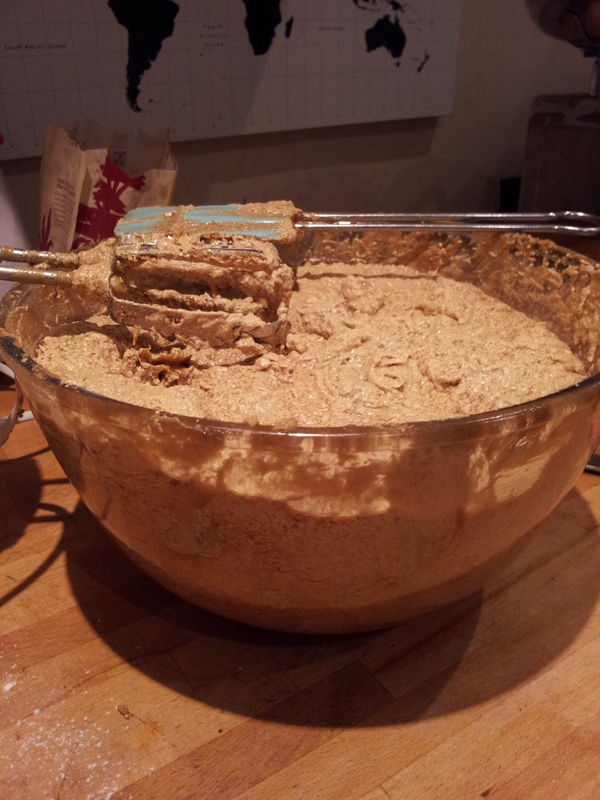 In hindsight starting a massive cake at 6pm is probably not the best plan. It takes at least an hour to combine all of the ingredients together and prepare the tins. Then it needs 6 hours in the oven. This meant I was babysitting the cake until 3am. I accidentally fell asleep and awoke with a fright with the oven timer going off, in my own personal inferno with the oven and the heating on, whilst wearing fleecy pyjamas, a dressing gown and a furry blanket with the cat sat on top of me. I forgot to turn this cake whilst it was baking, due to me being asleep and all , so the cake had a nice diagonal shadow across it, but once it had an extra feeding of booze and it was iced no one noticed. 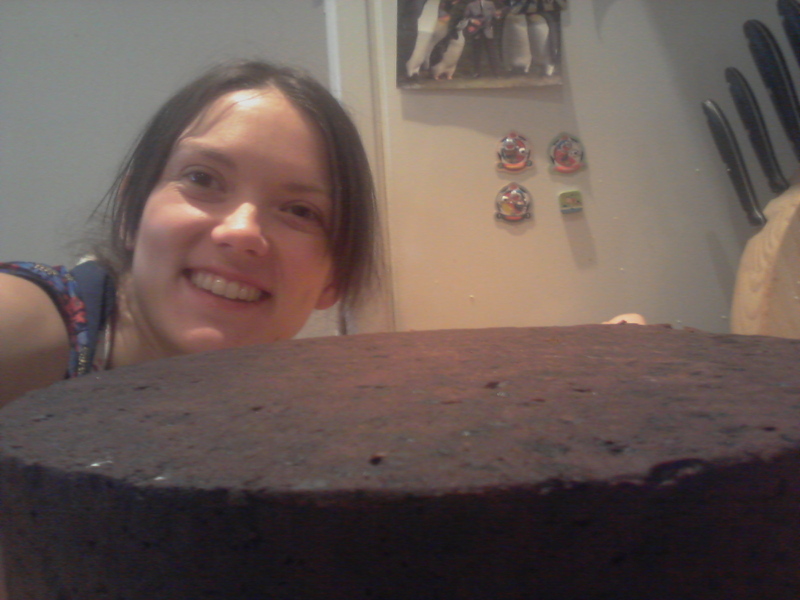 And with a cake this big, using so many ingredients there was no way I was going to start again! Putting things into slightly frazzled perspective. This cake was bigger than my head. Wow, congratulations! The cake looks amazing! Having just finished a miniature 4-tier birthday cake for a friend, with only plain ganache and a few things sprinkled on top, I am in awe of your professional looking wedding cake. Fabulous post – great photos!! We loved your wedding cake with ice cream when we came for dinner!! delicious! What an amazing day and what an effort making all of these, your cake really did look fabulous! Hello Alison I bought my dried fruit from my local shops. Most supermarkets do 500g or 1 kg bags of sultanas and raisins quite reasonably. I also used my local market or food weighhouse where you can buy dried fruit in whatever quantity you prefer. I find the candied mixed peel and glacé cherries are rather expensive for a small pot so I tend to only use one or two pots per cake (depending on the size of the cake). I then also try to buy other dried fruits which are affordable to bulk the cake out like dried cranberries, apricots, cherries, prunes, dates, pineapple and mango. Hope that helps! Just wanted to say the biggest thank you ever to you for posting up this wedding cake recipe. I got married last April and without you doing this blog I would never have had the perfect recipe to make my wedding cake. I did a trial run of your wedding cake recipe for Christmas and everyone was absolutely floored by how amazing they tasted and turned out so it gave me the confidence to do the same for my wedding cake as I knew the flavour would be there. I did two amaretto layers (as we love it in my family, the Malibu layer, an apricot brandy layer and a spiced brandy layer. I have to say the cake turned out amazing!! Beyond amazing!! Me and my mum often make novelty cakes but I had never done a wedding cake on such a scale. So with the help of your amazing step by step and working with my mum we created a beautiful cake that was totally stress free. My hints for those who would love to try the same is to make sure you plan out the making and construction of your cake on a good timescale this will allow things to run smoothly and will avoid stress. It was also enable you to alter things if anything goes wrong (always good to have a back up plan). I think from soaking my fruit to the wedding was about a 4 month scale. 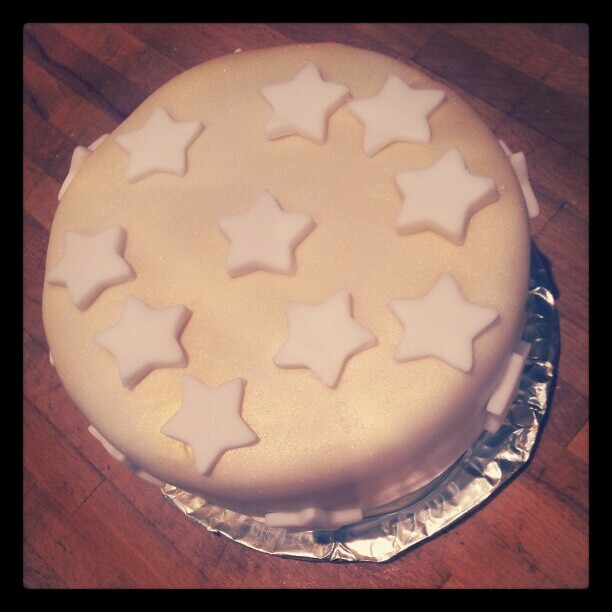 I had always dreamed of making my own cake and always wanted it to be huge but with simple decorations. I trimmed the cakes with chunky cream ribbons, a bow with a brooch, I made pearl chains to finish and had a lush ‘all you need is love’ topper (we love the Beatles). Wish I could add a picture but I don’t think I can. Wow Rachel! Congratulations! I’m absolutely over the moon that you found my little blog helpful. I bet your cake was amazing! I think my favorite layer was the amaretto. You’re absolutely right about planning the whole cake out and giving yourself enough time to do it all comfortably. That’s the beauty of fruit cake too that you can make it so far in advance. I’ve got to admit I still have one last tier uniced in my cupboard stored away just incase… 2 years on and it’s looking perfect. I’ve just topped it up with brandy to keep it from drying out too much. Hi Lizzie I’ve played around with this recipe quite a bit but not tried a square tin yet. 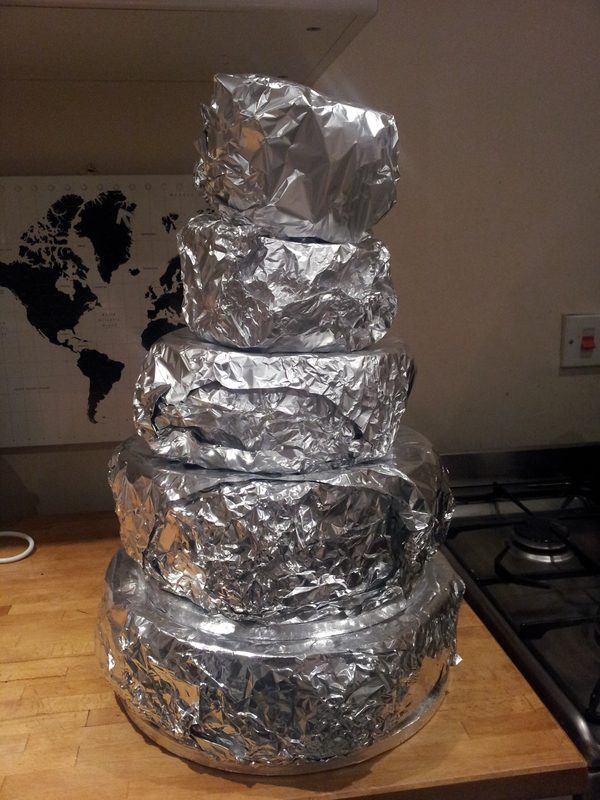 My general rule of thumb is to fill and level the cake tin so there’s about 1 or 2 cm of tin left above the level of cake. 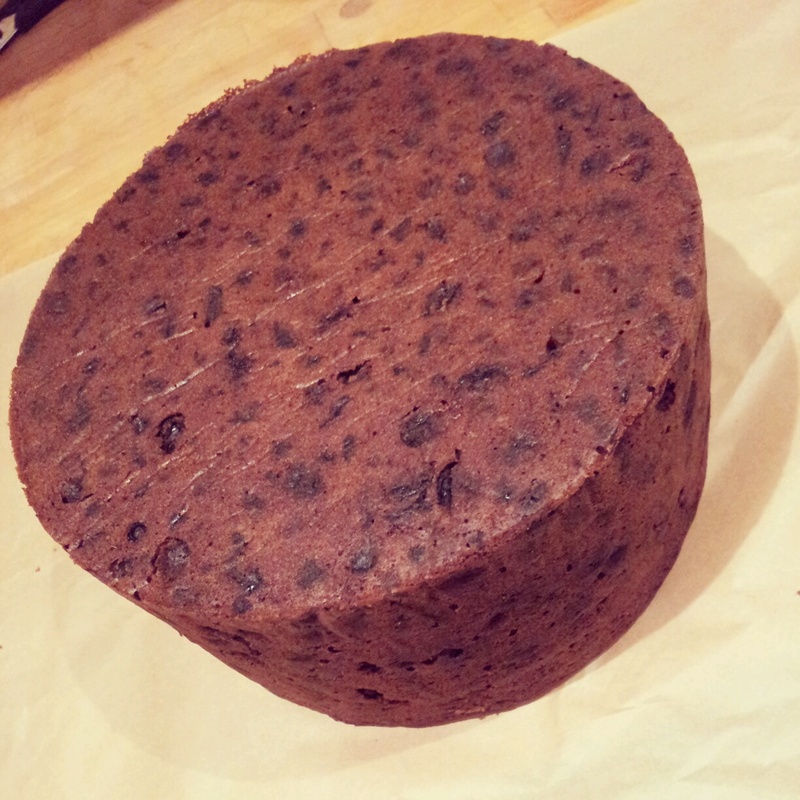 Fruit cake doesn’t rise as much as sponge which should only really be filled 2/3 of the way up the tin when baking. I then just check after the suggested amount of time in the oven with a skewer to see when it’s done baking. The cake should also be shrunk away from the sides of the tin a little and make a slight hissing/crackling noise when taken out of the oven. Hope that helps. What size tin are you using? A square tin will probably be a bit bigger than a round tin capacity wise so if using the equivalent round tin recipe it may just be slightly shorter in height and cook a bit quicker. Hi Katie you could make it any time really. The longer you mature it the better the taste. So I’d recommend baking it at least 2 months in advance. But I have made fruit cake 1 week in advance and it’s still tasted great. Good luck and happy baking! Hi, I did the 4 inch version and found I had left over batter??? Since then I have won a local “bake off” using the tropical fruit recipe, and I have just baked it again for a friends wedding cake – they get wed at the end of August. Thank you so so much for your comment Liz! 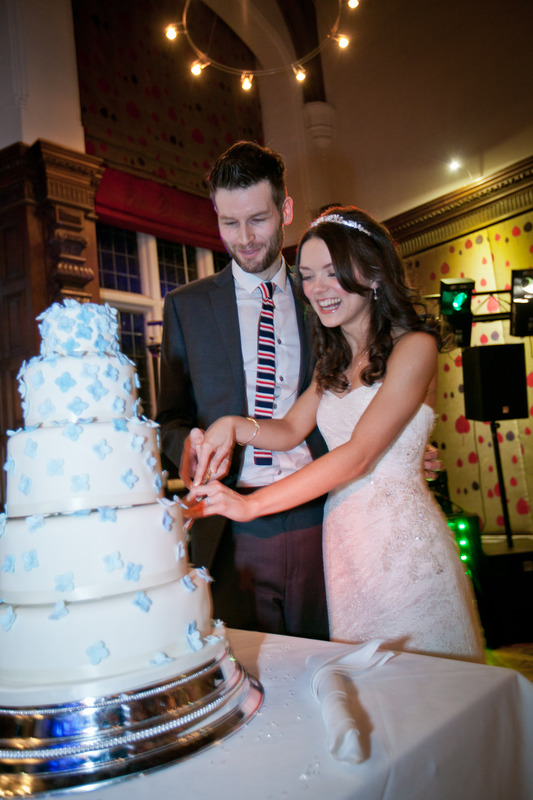 I’m absolutely over the moon that you found my blog and used the recipe for your wedding cake. 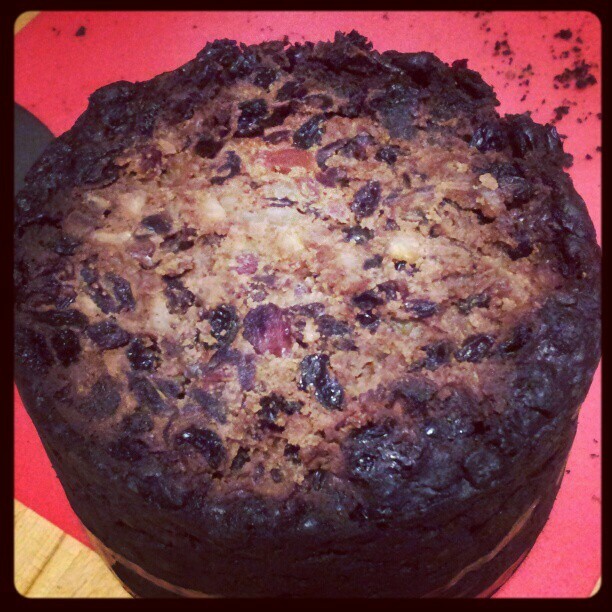 I bet it looked stunning as a naked fruit cake too. Glorious!! Amazing work on winning your local bake off too! And What lucky friends you have baking their wedding cake for them too. It sounds like a real show stopper! Wow unbelievable, Awesome, mind blowing, Speechless. Congratulations.you deserve a Gold Medal.In cake baking.Thanks for all the direction. Will Definitely be trying these Wonderful Cakes my Favorite.